It was while I was debating whether to spend the money on proper gift cards that the idea came to me. I wished there was a gift card program like the one at Orchard Park Mall but for locally owned businesses. I wanted a gift card that could pool the resources of many locally owned business. After some research, I quickly realized that a gift card program specifically for locally owned businesses wasn’t an option. It was common for large shopping centres to have a gift card program for all their stores but there was nothing locally for stores like mine. Here is where my two (almost three) year journey began. I am definitely glad that I just kept going. To make my idea a reality I needed to work with a larger corporation. However, large corporations are used to working with other large corporations and I was definitely not. Luckily after many hours of communication I found a company willing to take a chance on my idea. Something inside me wanted to make this idea a reality for so many reasons. The main reason being I know firsthand how hard it is to own a small business, especially when you are just starting out. And I had an idea that I honestly believe will help locally owned businesses so I couldn’t let it go. I am humbled and grateful that today The Local Gift Card is a reality. Hurdles have been overcome, tears have been shed and timelines have been re-written many times over. 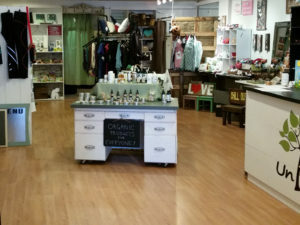 Now all that is left is too show our communities how important unique locally owned businesses are to our local economy. I am excited to share my passion for locally owned businesses and help drive new traffic to the amazing businesses that make our communities unique.